Clemson, SC – Clemson worked in shells (helmets, light shoulder pads and shorts) on the practice fields behind the Jervey Athletic Center for three hours on Sunday. It was the second consecutive full day of practice for the Tigers, who had the opening practice on Friday cut short by lightning. 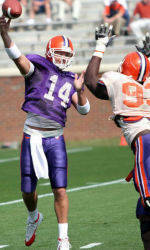 Clemson will be in shorts on Monday, then put on the full pads on Tuesday. The Tigers had a good workout from 3:45 PM to 7:00 PM, just about the exact time span the team will play when it plays host to Florida Atlantic in the first game of the season at Clemson Memorial Stadium on September 2. Temperatures were in the low 90s, but it was not as hot as it has been in Clemson in the last week. Clemson will continue with practice on Monday evening from 5:45 Pm to 8:45 PM. The practice is closed to the public. “It was an average shorts practice until Duane Coleman had a good collision with Aaron Kelly during skeleton drill,” said Head Coach Tommy Bowden. “That made it a more spirited workout. It created enthusiasm. The defense creates enthusiasm with collisions and the offense does it with big plays.” Coleman also had an interception during the drills and continues to play well at cornerback. Four players were in yellow jerseys and did not take part in practice on Sunday. Punter Cole Chason (cut foot), offensive tackle Jamarcus Grant (broken foot), wide receiver Rendrick Taylor (sprained ankle) and cornerback Sergio Gilliam (knee injury) all missed Sunday’s workout. All but Grant are expected to return this coming week. There were no new injuries reported during the practice. Clemson’s October 12 game against Temple in Charlotte will be televised by ESPNU. The game will kickoff at 7:30 PM, the same kickoff as had been announced earlier. The announcement gives Clemson at least four games on the ESPN family of networks this year. The Florida Atlantic game on September 2 will also be televised by ESPNU. The Florida State game on September 23 will be show on ESPN, as will the Virginia Tech game on October 26.